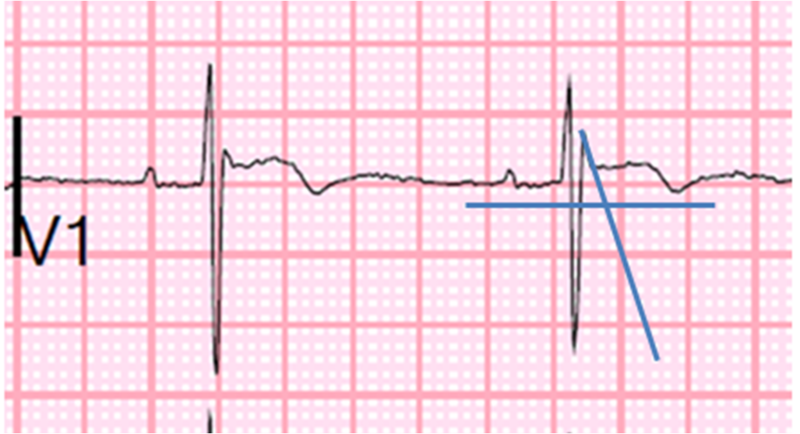 Dr. Smith's ECG Blog: Is this Type 2 Brugada syndrome/ECG pattern? Types 2 and 3 Brugada have been merged into Type 2. The diagnoses have been perplexing for years because they have been based on a "saddleback" morphology. However, saddleback morphology is a very common normal variant: "saddleback" morphology is rarely Brugada pattern and even more rarely Brugada syndrome. This is a post showing the difficulty of the decision to place an implanted defibrillator. Is this Type 2, or Type 3, Brugada pattern? Brugada syndrome is a condition which can lead to polymorphic ventricular tachycardia, ventricular fibrillation, and sudden death. Identifying it before death is important. Brugada syndrome requires BOTH 1) Brugada ECG pattern and 2) clinical criteria. Here is an example of type I Brugada pattern during fever that disappeared after antipyresis. It can be transitory and uncovered in a variety of situations (see below). The recognition and management of Type 1 Brugada pattern ECG is not entirely straightforward, but, in my opinion, it is far easier than the recognition and management of patients with possible Type 2/3 Brugada (Type 3 has morphology has now been incorporated into type 2). Here one of the Brugada brothers outlines the management of possible Brugada syndrome, but does not discuss type 2 in enough detail for me to understand it. Many articles and web sites simply state that a Type 2 Brugada pattern has a "saddleback" in V2. They discuss it no further. This is not helpful, because a saddleback is a very common pattern in V2 (up to 7% in of patients with no apparent heart disease) and is a normal variant in the vast majority of cases, especially in athletes. Saddleback is called saddleback because of an r'-wave (rSr') with an upright T-wave, forming a saddle. This is also known as right ventricular conduction delay, and, if the QRS is wide enough (but not greater than 120 ms), it is incomplete right bundle branch block (I-RBBB). How does a non-electrophysiologist go about suspecting Type 2 Brugada? Again, one must distinguish between the syndrome and the ECG morphology. The morphology alone is not enough for the diagnosis. There must also be the right clinical context (see below) or positive electrophysiologic testing. How do we recognize type 2 Brugada morphology on the ECG? Fortunately, there was a consensus paper on this topic written by Bayes de Luna and the Brugada brothers. Here is the full text of it. There is also a very nice paper (full text html link): Differential diagnosis of rSr' pattern in Leads V1-V2: Comprehensive Review and Proposed Algorithm. This is by the same authors of the new criteria for type 2 Brugada, so it is fairly authoritative. (Here is a link to the full text pfd). 3. Incomplete RBBB, with delayed conduction through right bundle. No associated adverse outcomes. However, there is a higher incidence of subsequent development of complete RBBB. A young athlete had a painful condition for which he was seen in the ED. After an episode of pain, he had a syncopal spell with complete loss of consciousness and postural tone, with spontaneous awakening. There was a prodrome which seemed vasovagal in character. He had started having lower abdominal discomfort and pressure, associated with some diaphoresis, then started feeling dizzy and passed out. He spontaneously regained consciousness. He had no prior history of syncopal spells. There was no family history of premature sudden cardiac arrest in first degree relatives. There was no history of exertional syncope or post-exertional syncope. He had a normal exam in the ED. Is it type 2 Brugada pattern? Is it type 2 Brugada syndrome? 1. It is not type 1 Brugada. 2. The takeoff/downstroke of the ST segment in V1 and V2 is not flat enough ("beta" angle not wide enough) for it to be type 2 Brugada. A pronounced r'-wave is common in athletes. Findings may be dynamic and are sometimes concealed; findings may be observed only in certain circumstances such as fever, intoxication, electrolyte imbalance, presence of sodium channel medications/drugs, or vagal stimulation. (e) Type 1 Brugada pattern in relatives. Corrado index (see below) = 1.5/0.5 = 3.0. Thus it is greater than 1.0. 4. The peak at the high takeoff does not correspond with the J-point. It is BEFORE the J-point, as measured in other leads (such as lead II across the bottom). 5. 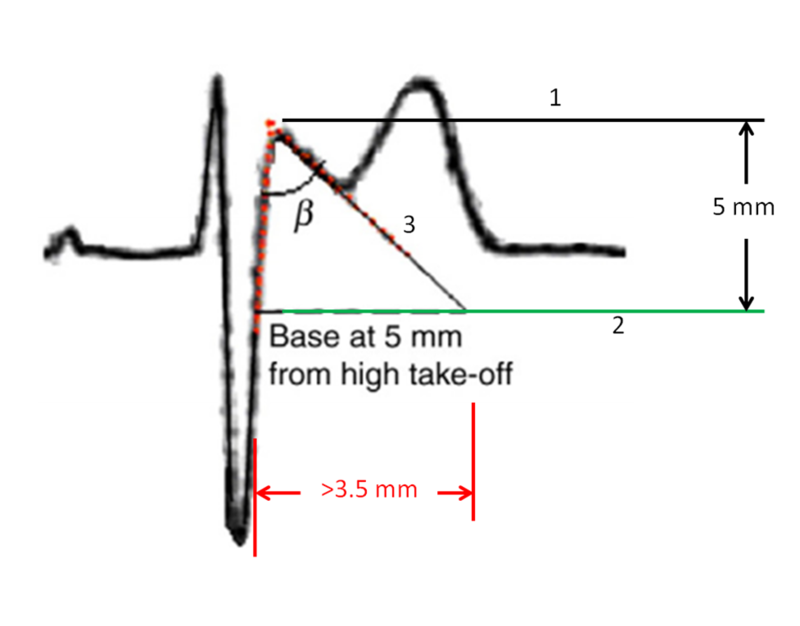 Gradual downsloping of ST segment such that at 40 ms after the takeoff, the decrease in amplitude is less than 4 mm (in this example, it is less than 1 mm). In normal RBBB, the decrease in amplitude is much greater (see this example). 7. "The duration of QRS is longer than in RBBB," and "there is a mismatch between V1 and V6." This criterion is perplexing and not well explained. 8. The downsloping should be such that the Corrado index is greater than 1.0 (see example above). [ST elevation at 80 ms after the J-point]. In the consensus paper we are discussing here, types 2 and 3 Brugada have been merged into one type called type 2. They specify the criteria to be used (below). a) An RSr' with a typical saddleback pattern in V1 and/or V2. 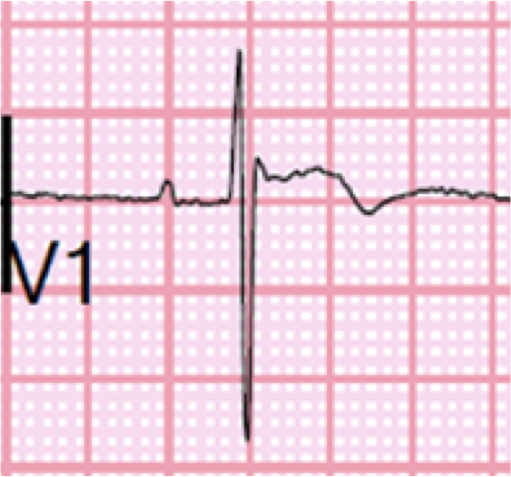 b) V1 may have either an upright, flat, or inverted T-wave (in our case above it is inverted). c) T-wave in V2 is usually but not always positive. d) Minimum ST segment ascent of 0.5 mm. There could be no saddle without an ascent. 2. Mismatch between QRS duration in leads V1 and V6 (longer in lead V1). This helps to distinguish from RBBB, in which the QRS duration is equal in V1 and V6. 3. 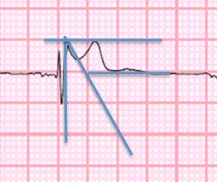 As with Type 1, the peak of the r'-wave does not correspond to the J-point in other leads. The distance from the S-wave to the almost vertical line is less than 3.5 mm, so does not meet criteria. How about in lead V2? This drawing is incorrect, and only to show how it should NOT be done. Both lines must be drawn from where the downsloping begins at the top of the r' wave. The data for this comes from this study comparing patients with known high risk type 2 Brugada syndrome to athletes with rSr'. The full text can be found here. The criteria as studied in these comparison populations were approximately 90% sensitive and 90% specific in this study. In patients with Brugada, the Brugada morphology can be unmasked by recording V1 and V2 at higher interspaces (see this paper). Recording V1 and V2 one or two interspaces higher, over the area of the heart that is most likely to produce the Brugada pattern, should make the pattern more apparent. If it did so, that would be very suggestive of Brugada. 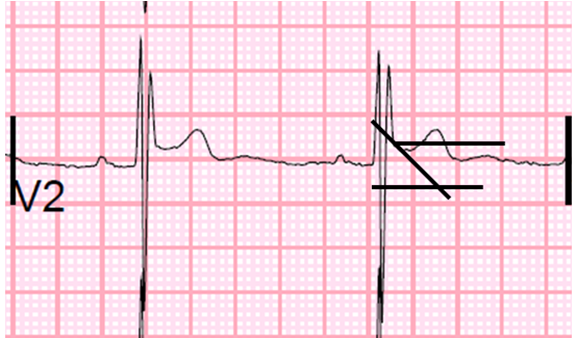 Notice that there is T-wave inversion in V2 (but not Brugada pattern!). High lead placement is one of the causes of "abnormal" T-wave inversion in V2 and beyond. Additional etiologies were considered for his syncope given he is a collegiate athlete including HOCM, catecholaminergic polymorphic VT, and arrhythmogenic right ventricular dysplasia. Transthoracic echo did not show any evidence of HOCM or right ventricular dysplasia. EF was normal. He had no known family history of sudden cardiac death at a young age. The electrophysiologist was confident that this was not Brugada, that a procainamide challenge test could be done but that this would normally be done only for "unexplained" syncope, not for typical vasovagal syncope. The patient was discharged with no exercise limitations. He left open the possibility of an exercise test to rule out catecholaminergic polymorphic VT (CPVT), which occurs during stress and exercise. However, without an exertional component, the probability of CPVT was very low. Here is a patient who presented with recurrent pre-syncope and palpitations. The base of the triangle is about 3.5 mm, and it meets the other criteria. The electrophysiologist was worried enough about type 2 Brugada that he placed an implantable loop recorder. This 40-something patient presented with dizziness and chest pain. The dizziness seemed to be vertigo more than pre-syncope. 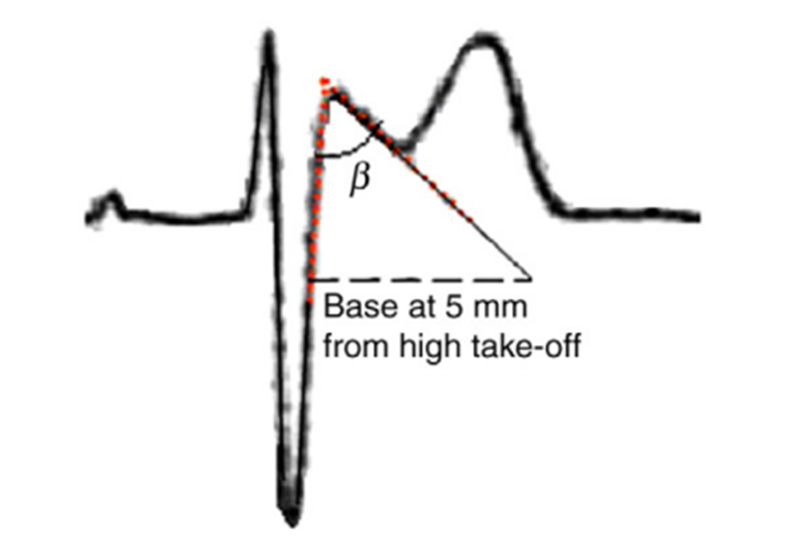 The base is greater than 3.5 mm, and other criteria for type 2 Brugada Pattern are present. In this case, the patient underwent a stress test for his chest pain, but the diagnosis of type 2 Brugada was dismissed because of the absence of clinical criteria. Dizziness due to vertigo was not enough. Excellent post. Worthy of an extra bookmark! But as a family physician, it is important for you to know whom you need to send to a cardiologist for further evaluation, right? This article might help and be a good resource for you. Hi. Doctor, by chance, incomplete right bundle branch block, can cause saddleback? I encounter a lot, and this is a question that I wanted to take to clean.